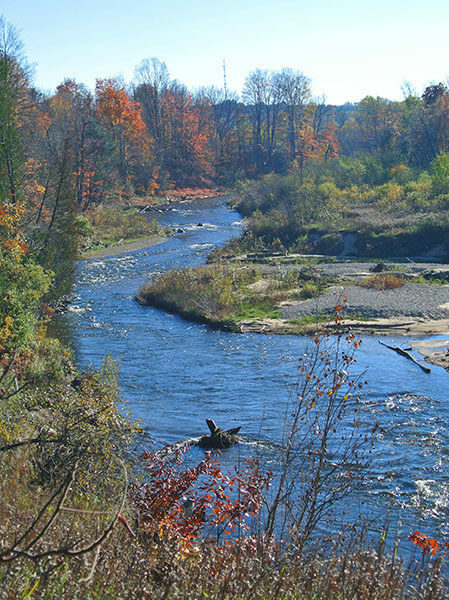 The 525-acre Natural Education Reserve is a long, narrow preserve that includes more than 5 miles of the Boardman River. North of Cass Road is the Boardman Valley and the Sabin Pond Trails and the Boardman River Nature Center. 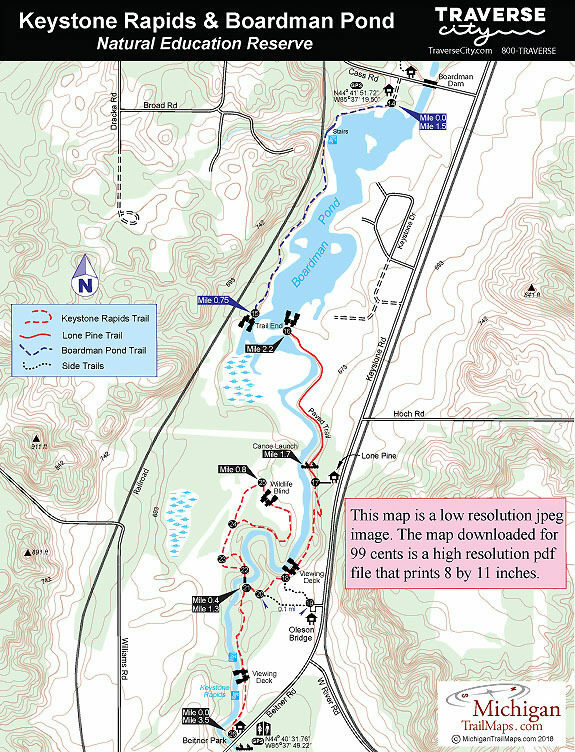 South of Cass Road is the Boardman Pond, Lone Pine and Keystone Rapids Trails. Both sections of the reserve are popular but the Keystone stretch of trails on the east side of the river are particular popular in the April and May when spring runoff create Class II rapids, drawing the attention of kayakers and other whitewater enthusiasts. In 1909, the Keystone Dam, the third dam in what today is the Natural Education Reserve, was built across the Boardman River and when it washed out in a heavy rainstorm in 1961 it not only changed the course of the river but also the destiny of the area. 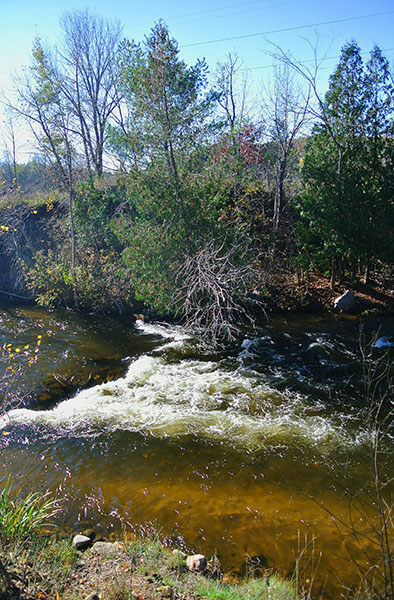 Without the Keystone Dam, the 12-acre impoundment behind it disappeared, leaving behind a half mile stretch of whitewater, some of the most impressive whitewater in the Lower Peninsula. Even more significant to many was Consumers Power’s offer after the catastrophe to sell the entire area, including the still standing Boardman and Sabin Dams, to Grand Traverse County for $1. The county accepted the offer and in 1976 the Natural Education Reserve was officially dedicated. 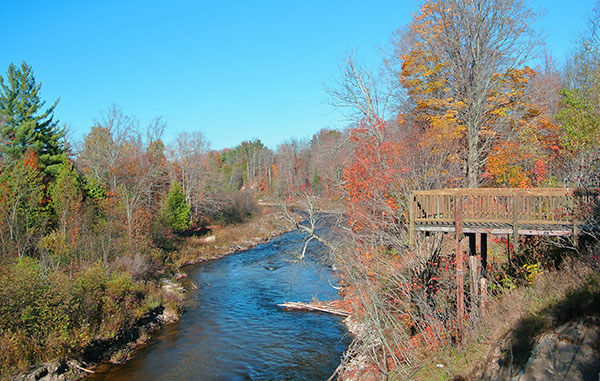 Today the long, narrow reserve spans 525 acres and includes more than 5 miles of the Boardman River. North of Cass Road is the Boardman Valley and the Sabin Pond Trails and the Boardman River Nature Center. South of Cass Road is the Boardman Pond, Lone Pine and Keystone Rapids Trails. Both sections of the reserve are popular but the Keystone stretch of trails on the east side of the river are particular popular in the April and May when spring runoff create Class II rapids, drawing the attention of kayakers and other whitewater enthusiasts. The trail described here also includes the paved, barrier-free Lone Pine Trail for a 3.5-mile round-trip from Keystone Rapids Trailhead in which in the first half mile hikers will have a good view of the whitewater and any daredevil paddlers playing in it. On the west side of the river is the Boardman Pond Trail, a point-to-point path that makes for a 1.5-mile round-trip from its trailhead on Cass Road. Currently the two segments are not connected although long-term plans call for joining Boardman Pond with Keystone Rapids. The addition of such a segment would create an unbroken, 5-mile route from South Airport Road to Beitner Road. Keep in mind that parking at the Keystone Rapids Trailhead and Beitner Park across the street is limited and on weekends can be busy with the lots often full. If that’s the case, less than half mile to the north on Keystone Road is Oleson Bridge Trailhead where there is ample parking and a short spur to the Keystone Rapids Trail. The Keystone Rapids Trailhead is post No. 26 and from there you head north to follow the east bank of the Boardman River. Almost immediately the namesake rapids appear and the whitewater is enjoyed at several viewing points including an observation deck reached in less than quarter mile. The Keystone Rapids are legitimate Class II whitewater in the spring but due to the ongoing project to eventually remove the Sabin and Boardman Dams, the river is in a constant state of change. That includes the rapids. The velocity of the river is increasing and no doubt new stretches of whitewater will appear along this stretch. Post No. 21 is reached at Mile 0.4, marking the south end of a long foot bridge across the Boardman River. On the other side is a nearly mile-long loop. If followed in a clockwise direction, just past post No. 25 is an aviary-viewing overlook, or wildlife blind, perched above open meadows and wetlands. You return to post No. 21 at Mile 1.3 and head east to quickly pass the two spur trails, marked by at post No. 20 and post No. 18, from Oleson Bridge Trailhead. Just past the second spur is another viewing deck. The trail continues to skirt the riverbank for a very scenic stretch that includes a foot bridge over a side stream. A posted detour forces you to climb around an area of riverbank erosion before the trail resumes skirting the riverbank, arriving at post No. 17 at Mile 1.6. The post marks the start of the paved, barrier-free Lone Pine Trail with the trailhead just to the east (right). Lone Pine Trail continues north to quickly pass the Lone Pine Canoe Launch and the stairway descending to it. Eventually the paved trail leaves the forest to more expansive views of the Boardman River where a handful of benches have been placed. Two of them have been placed at post No. 16, reached at Mile 2.2, marking the north end of the Lone Pine Trail, where you can look out over the Boardman Riveand what remains of the Boardman Pond. You need to backtrack to return to the Keystone Rapids Trailhead on Beitner Road, a 1.3 mile walk if you skip the loop to the aviary-viewing overlook. The Boardman Pond Trail begins at post No. 14, marking a trailhead and parking area on the south side of Cass Road across from the Beaver Pond Trailhead, post No. 13 and the Boardman Dam. 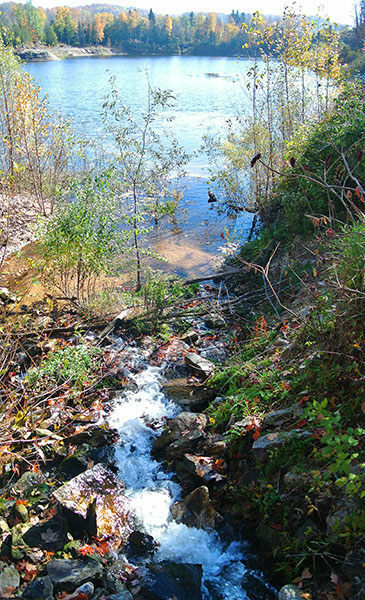 The trail begins on a levy with views of the Boardman Pond but in less than a quarter mile swings south and descends a stairway to a side stream gushing out of a pair of culverts like a waterfall. Just beyond the cascade, the trail swings within view of the railroad and then away from it for the rest of the hike. You remain in the forest with views of the impoundment and the Boardman River until arriving at post No. 15 at Mile 0.75. There is no observation deck here but there are views in almost every direction. Backtrack to return to the trailhead on Cass Road for a round-trip outing of 1.5 miles. The 5-acre Beitner Park, across the street from the Keystone Rapids Trailhead and parking lot, includes picnic areas as well as restrooms and a canoe launch. Beitner Park is heavily utilized as a boat launch and takeout area for canoes, kayaks, and inner tubes. For inexperienced users, the Park serves as an exit off the Boardman River to avoid the Keystone Rapids located just downstream. More experienced users can run the Rapids from Beitner Park to the Lone Pine Canoe Launch. The Natural Education Reserve trails are open year-round but are not groomed for cross-country skiing. There are no fees to use the trails. From South Airport Road in Traverse City turn south on Cass Road and follow it 2.6 miles to the Boardman Dam. 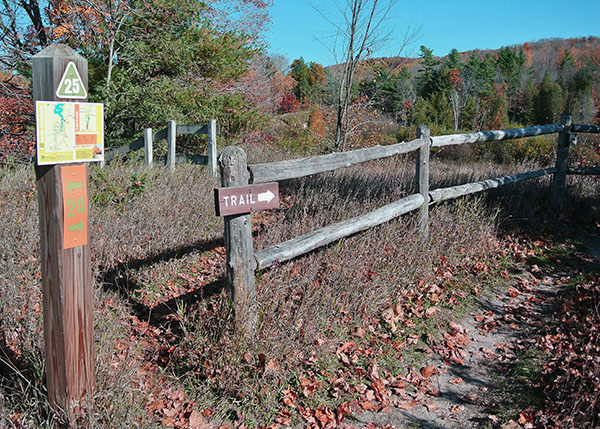 Just before crossing the Boardman River, the posted trailhead to Boardman Pond Trail will be on the south side of Cass Road. To reach Keystone Rapids Trail head continue another quarter mile on Cass Road and then turn south (right) on Keystone Road. Within a mile you will pass the posted Lone Pine Trailhead and in 1.3 miles the Oleson Bridge Trailhead. Continue on Keystone Road as it swings west and becomes Beitner Road and within a half mile from Oleson Bridge Trailhead, or 1.8 miles from the Cass Road intersection, the posted Keystone Rapids trailhead will be on the right.